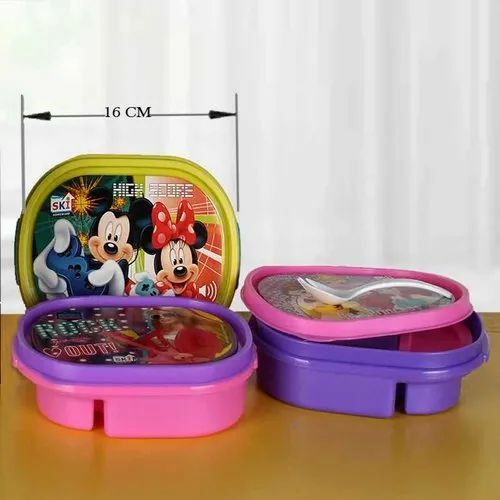 Set Content Includes one big and one small lunch boxes with spoon and fork. lunch box is perfect for school, travel and day out. The print on the box makes it fun for kids to carry. Includes one big and one small Cabin in box with spoon. Easy to wash and clean. Made of good quality plastic. It will easily fit into a backpack.Available in 3 different themes Barbie, Princess & Mickey Mouse.These are best suitable for return gifts of birthday parties or any other occasions for kids. Packaging Details Doraemon Print lunch box is perfect for school/ travel and day out. The print on the box makes it fun for kids to carry. Includes one big and one small lunch boxes with spoon and fork. Easy to wash and clean. Made of good quality plastic. It will easily fit into a backpack. These are best suitable for return gifts of birthday parties or any other occasions for kids.